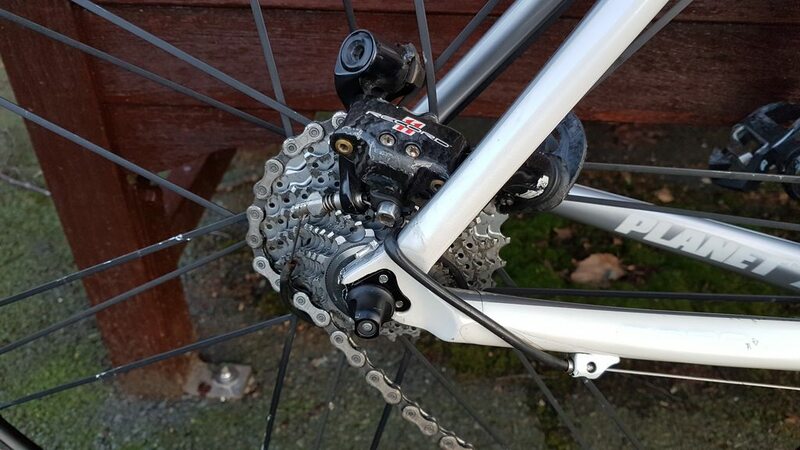 I've heard about this happening to others and usually it appears to be set up related such as the rear mech going into the spokes or crashes that cause it. Unfortunately for me this was a failure of the rear gear hanger and no other cause. It happened to my Planet X nanolight frame which is approaching 8 years old. The bike has had the same groupset on throughout that period which is pre-2015 Record. I only changed the rear gear hanger before this winter so about September because the original came loose and I thought it looked a bit worn so purchased a wheels manufacturing one exactly correct for the frame. There was no warning but I was so lucky to have barely been going any speed at all pulling across a junction when the rear wheel totally locked up and the mess below was what I was presented with. It's fine for wheels manufacturing warranty to say 2 years guarantee (or is it lifetime?) but the fact the rear drop out also got ripped off leaves me with a written-off frame. I'm sure the warranty doesn't cover collateral damage. Anyway here we go. It means I need to get a wet weather bike sorted out as this was my winter bike with mudguards on so it gives me the opportunity to possibly go with discs. I'll start another thread on that as I'm undecided on a few bits of kit but need to pull the trigger on it quickly as I can't stand the idea of riding on wet roads without mudguards! Immediately after it had happened, found a nice bench to sit on while awaiting a pick up! It was totally jammed in here. I managed to disassemble what was left of the jockey wheels, the remains of the gear hanger and a gentle tease with a pry bar and off it came. Ouch! That hurts. But how can you say it was the hanger that just broke for no reason. Looks to me like it did exactly what it’s supposed to do, break off in the event something bad happens. The chain is on the largest cog, which is consistent with where it would be if the cage got caught in the spokes. Those damaged spokes are certainly indicative of being caught up in all the action. So, couple of things may have happened. You say you replaced the hanger once before with a Wheels Mfg hanger. Those are very good hangers and my first goto when I need a replacement. But when you replaced it, did you 1) use loctite on the hanger screws; and 2) properly align the hanger afterwards; and 3) properly adjust the lower limit screw? The hanger screws could have loosened up, allowing enough play for the derailleur cage to come in contact with the spokes. The limit screw could have loosened up a bit as well. Did you ever notice and slight “pinging” when in your largest cog leading up to this event? If so, that was the sound of your cage too close to the spokes and an adjustment was needed. 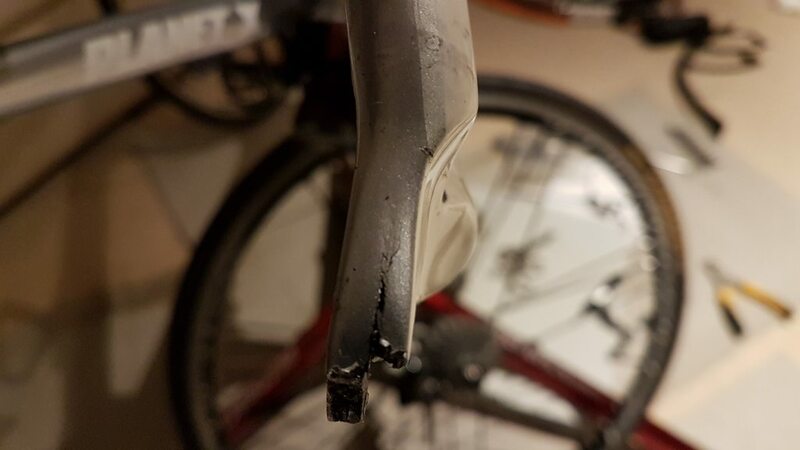 Or, maybe the derailleur got leaned on something and bent the hanger enough that it needed to be aligned again, but unfortunately catastrophe hit first. The weird “split” in your remaining dropout piece looks a little strange as well. Looks like it was almost two pieces laminated together and was coming apart. You’ll never know for sure exactly what happened imo, since it just “happened” right? I assume you weren’t staring closely at it while riding at the exact moment it broke to be able to say for certain that the hanger just snapped for no reason. Because I think that is the most unlikely scenario of all. Anyway, sorry for your misfortune. What’s next? So I'm thinking of getting my first ever disc brake bike as it will be a dedicated wet weather bike. Frame-wise I'm really liking the looking of the Ribble range in particular the endurance SL https://www.ribblecycles.co.uk/ribble-e ... e-sl-disc/ which has discreet mudguard mounts. 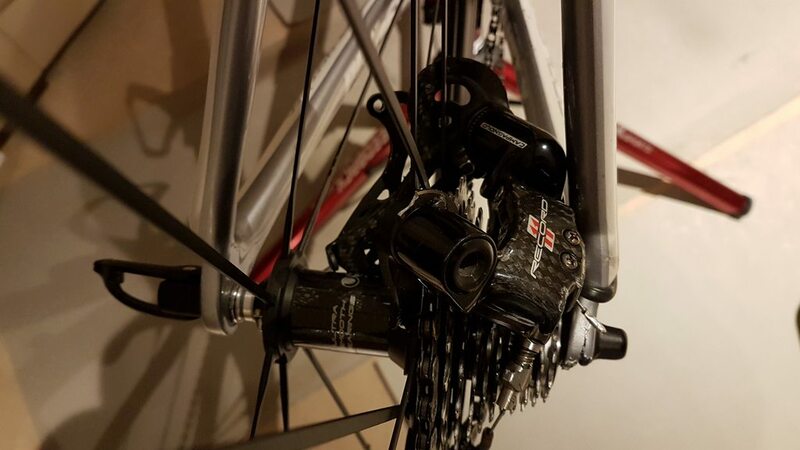 It will be Campagnolo 11 speed HO mechanical and probably super record front/rear paired with my current P2M type s power meter. The main issue I have is wheels. I was thinking Bora one 35s but I like the look of Hunt wheels https://www.huntbikewheels.com/products ... 27wide-999. They're £500 less than the Bora's and are a C21 compared with C17. Any thoughts would be welcome as I'm unsure at present. Another could be the Fulcrum Racing Quattro carbon with a similar price to the Hunt but quite a weight penalty and also C17. I'm guessing that's where the cost cutting is with that weight penalty. Hmmm... doesn’t sound like money is s major limiting factor. I’d get the Boras. That's nasty, I had such a failure last year (chain jammed between jockey wheel and cage). Doesn't matter how loose the hanger screws get, if the qr is tight, the hanger won't move. At a pinch, you could run without the screws. Would make wheel removal/replacement a bit fraught though. Have seen the same happen several times, with damage to wheel, frame, mech, chain. Very bad luck. Any chance you were using a quick-link? No just a standard chorus 11 chain. I don't think I'll ever know the exact cause but i just think myself lucky i was barely moving. If it had happened at speed I'd have been a mess all over the road. Have a good look at how much off axis play there was in the jockey wheel bearing/centres and check the side plates for damage/cracking. They are the two "non-normal" modes i've seen recently for this sort of thing. Chains jamming/jumping off the jockey wheels and getting wedged somewhere, or a sideplate cracking and snagging on the mech cage. If the hanger had a serious flaw and simply broke under normal use is it likely to have caused that much damage to the dropout? Looking at it my gut feel would be that something else jammed, caused an extreme side/twist force on the mech and broke the dropout just before the hanger gave up. Time to search the net for used Campag RD’s. You could build one out of what’s left from yours. I have a shamal spoke also I can get more in fact GFK on here has a few. yes they are expensive and it may not be worth fixing the shamals depending on how many spokes are damaged. Seeing the damage something jammed. No idea what though. either that or you carried on pedalling after the intial break and not for long either by the looks of it and rip... Bad luck what ever the cause. Get the bora's you might as well. Its only money. C60rider, sorry about your mishap. I'm glad you don't have medical bills. I have seen it several times with 10 speed: both Campag and SRAM. 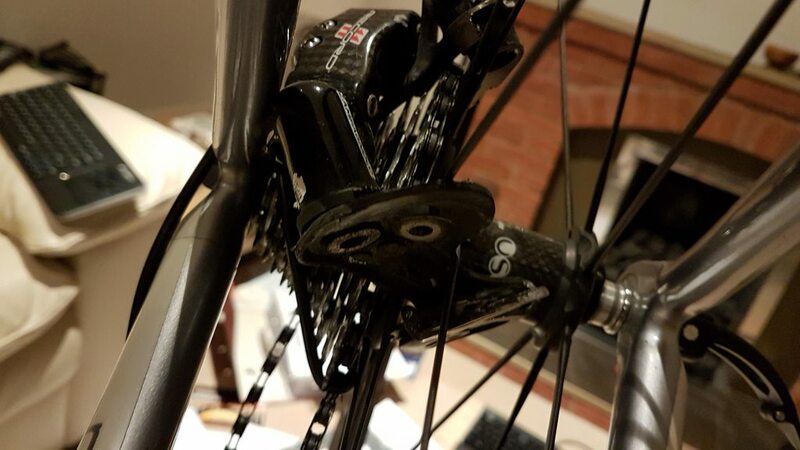 Rear derailleur hanger fitting issue? Derailleur Hanger cracked, Canyon Aeroad. Possible causes?